The “Tip Top Town” now has its own entry in the “Images of America” series, depicting the town’s growth from a wilderness outpost to a bustling logging town. Tupper Lake contains hundreds of photos that Jon Kopp, the town historian and former director of the Chamber of Commerce, selected from the archives of the Goff-Nelson Memorial Library and from his own collection. Kopp also wrote the informative captions accompanying the photos. The title is part of a series by Arcadia Publishing, which has released hundreds of books of photographs depicting the history of communities throughout America. Many of the photos in the first chapter show the hotels where the first tourists stayed in the nineteenth century and the waterways they used to get to Tupper. In the days before roads, Kopp writes, travelers would boat across the Saranac Lakes and take an ancient Indian carry to the Raquette River to reach the town. There also are photos of Mart Moody, who built the first hotel on Tupper Lake, and Pliny Robbins, another hotelier who also was a steamship operator (in the late 1800s, these ships competed with the guides). The second chapter depicts the town’s growth as a logging community in the late 1800s and early 1900s. 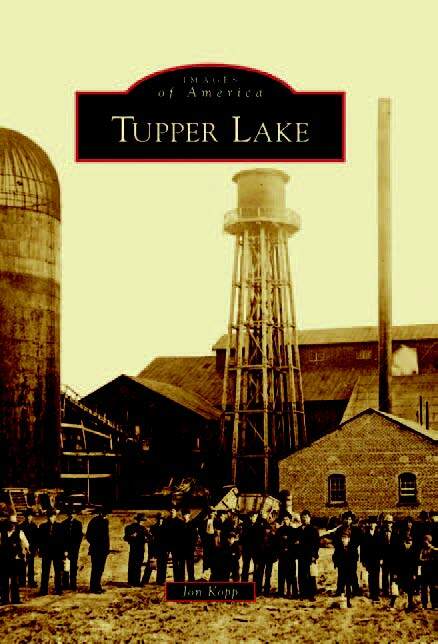 The photos include images of logging camps, and of John Hurd’s Big Mill, which operated from 1890 to 1926 and was the economic backbone of Tupper Lake. Kopp says most of the early buildings in Tupper were built with lumber from the facility. Railroads helped foster the growth of the logging industry: the Northern Adirondack Railroad reached Tupper Lake in 1890, and the Malone and Mohawk Railroad was built a year later. The neighborhood where they crossed is still known as “The Junction,” and it developed into the most important rail junction between Utica and Malone, Kopp writes. Other photos show Tupper Lake after the Big Fire of 1899 destroyed two-thirds of the village and how the village looked just a few years later, having rebuilt quickly. Almost the entire business section of Tupper Lake’s upper village was destroyed by fire in 1899. “The Town Matures” includes photos of industries that sprang up in the region, such as International Paper’s mill in Piercefield and the Oval Wood Dish factory on Demars Boulevard. We also see other businesses and institutions that grew up with the village: churches, stores, schools, barbershops. The streets are more crowded with people. There are photos of community celebrations, bands, sports teams, and other signs of the town’s maturation. The first image in “The Future Unfolds” is of the Hosley Farm, which the village bought in 1922 to build Sunmount Veterans Hospital. A series of photos shows the construction of the facility that would become so important to Tupper Lake’s economy. Now a state-run facility for the developmentally disabled and mentally ill, Sunmount is the community’s largest employer, with 1,700 workers. It has group homes scattered throughout the area. The last chapter also contains photos of businesses from the early and middle twentieth century, some still recognizable today, such as the movie house that is now the State Theater. There are images of fishing, of a crosscut-saw contest at Woodsmen’s Field Days, and of a logging camp (Kopp notes that logging camps existed well into the 1950s). Aside from a few photos—such as one of Senator Robert Kennedy’s visit in 1965—the book stops in the mid-twentieth century, a little before the opening of the Big Tupper Ski Area, another milestone in the town’s history. Flipping through Tupper Lake gives one an appreciation of the pioneering spirit of this hardscrabble Adirondack community, and that’s one thing that history hasn’t changed.